Oral mucosa constitutes a protective barrier against harmful factors. In order to fulfil its function properly, it must be lubricated at all time and its structure cannot be damaged. Therefore, it is vital that the proper function and lubrication of the throat and larynx mucosa be appropriately cared for. dog rose – contributes to supporting the natural immune strength of human body. It facilitates the optimum function and protects the mucosa of the upper respiratory tract. Blackcurrant Flavour Fiorda: gelling agent – gum arabic, humectant – sorbitols, water, Iceland moss thallus extract (Cetraria Islandia L.), humectant – maltitol syrup, acidity regulator – citric acid, (milk) lactoferrin, dog rose fruit extract (Rosa canina L.), blackcurrant fruit juice, blackcurrant flavouring, glazing agent – Carnauba wax, elderberry fruit juice, sweetener – sucralose. Lemon Flavour Fiorda: gelling agent – gum arabic, humectant – sorbitols, water, Iceland moss thallus extract (Cetraria Islandia L.), humectant – maltitol syrup, acidity regulator – citric acid, (milk) lactoferrin, dog rose fruit extract (Rosa canina L.), lemon fruit juice, flavouring — lemon oil, glazing agent – Carnauba wax, sweetener – sucralose, colouring agent — riboflavin. Mint Flavour Fiorda: gelling agent – gum arabic, humectant – sorbitols, water, Iceland moss thallus extract (Cetraria Islandia L.), humectant – maltitol syrup, (milk) lactoferrin, dog rose fruit extract (Rosa canina L.), natural mint flavouring, glazing agent – Carnauba wax, mint oil, sweetener – sucralose. This product contains a sweetener. This product contains naturally occurring sugars. Do not use in case of hypersensitivity to cow milk protein. Excessive intake may have a laxative effect. Do not take more than the Recommended Daily Intake. Do not use the dietary supplement as a substitute for a varied diet and healthy lifestyle. 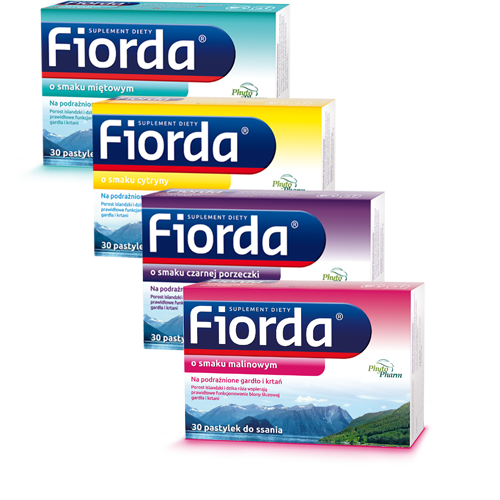 Fiorda is safe for pregnant and breastfeeding women.